Fond du Lac Reservation makes no representations about the suitability of this map for any purpose. The map is provided 'as is' without expressed or implied warranties, including warranties of merchantability, and fitness for a particular purpose or noninfringement. Using the scroll wheel on your mouse will zoom in and out on the map. The currently visible basemap can be toggled by clicking the Basemaps option on the toolbar. The currently visible theme layers can be toggled by clicking the Themes option on the toolbar. Clicking on a feature of interest on the map, will display a popup box with information about the features at the location clicked. If multiple features are present at the same location, a scroll button will appear in the popup box that will allow you cycle through each feature. Clicking on a parcel will allow users to view additional information for the selected parcel by clicking on the "More Parcel Information" hyperlink at the bottom of the popup box. Allows users to draw point, line, and polygon map mark-up information on the map in a variety of different shapes and colors. This tool will generate a hyperlink and an email (based on your default email client), allowing you to send the desired map view via a hyperlink in an email. The legend is dynamically populated and displays the currently visible map layers. 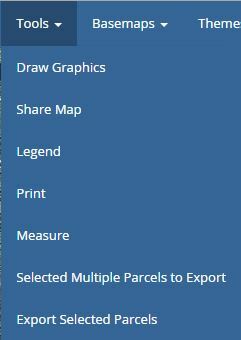 Allows users to print the currently visible map to PDF in a variety of map size layouts. Allows users to measure coordinates, lines, and areas on the map. 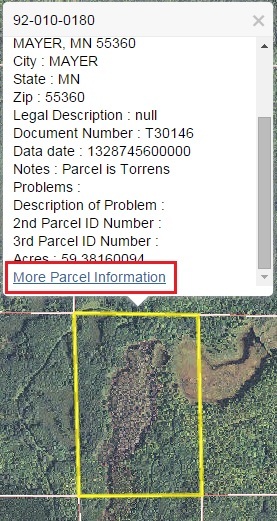 This tool is used to quickly select multiple parcels on the map by drawing a rectangle around the area of interest. This tool will export the selected parcel information to CSV format. Once exported, the file may be saved by the user. An error was encountered printing this map. Sorry. Select a measuring tool to get started. No tool has been selected. There are zero features selected. Click and drag to make an initial selection then hold down the CTL button to select additional parcels if desired. Select a symbol to get started.